When Chinese Foreign Minister Wang Yi condemned the ongoing absence of a Palestinian state as “a terrible injustice” after a meeting with his Palestinian counterpart on April 13, he continued a long and proud tradition of cynically criticizing rights abuses abroad to distract from the Chinese government’s misdeeds at home. With its poor record on human rights and ongoing crackdowns on rights activists in the name of national security, China is hardly in a position to lecture others on injustice: under Xi Jinping’s heavy thumb, torture remains a commonly used interrogation method, civil society organizations are being dismantled at a rapid pace, and freedom of the press is at an all-time low. It should come as no surprise that, at least for people whose human rights have been violated by Beijing and its partners, Wang’s statement rang hollow. Unfortunately, China’s hypocrisy is not limited to its own territory: Beijing has no scruple maintaining relationships with some of the most repressive regimes on the planet, empowering them to crush their own dissenters with its help. 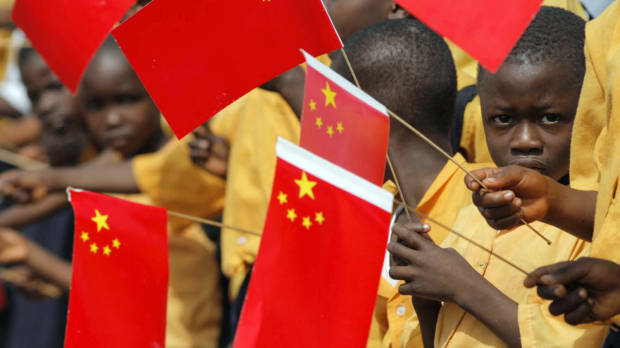 While Beijing’s partnership with North Korea and Kim Jong-un is currently in the international spotlight, China has long gotten away with backing dictators in Africa with far less attention. The calculus is simple: in exchange for the resources required for China’s sustained economic growth, the Chinese government provides cash, weapons, and even diplomatic cover for its oppressive African partners. All the while, Chinese government rhetoric claims to stand for historical justice and the betterment of third countries through development. Robert Mugabe is a trademark example of this dynamic at work. Despite Mugabe’s appalling human rights record and repeated calls for him to stand trial for crimes against humanity in Zimbabwe, China has sought to foster a strong relationship with his regime. Beijing chooses to cozy up to the nonagenarian on account of his country’s plentiful reserves of copper, platinum and diamonds. Given Mugabe’s economic isolation and poisonous reputation among Western countries, this outside support could not be more vital to his regime. China invested $4 billion in Zimbabwe last year, and was Harare’s largest trading partner in 2015. Meanwhile, Mugabe’s policies have destroyed the economy and the living standards of average citizens. The poverty rate in Zimbabwe now stands at 63% but it can go as high as 90% among rural farming communities. While more than happy to highlight the plight of the Palestinians, Beijing has been suspiciously silent about the suffering of Zimbabweans. In fact, China describes itself as Zimbabwe’s “all weather friend.” On top of its steadfast support, China even has sought to stroke Mugabe’s ego by awarding him the Confucius Prize, the Middle Kingdom’s own bizarre version of the Nobel Peace Prize, in 2015. The Chinese government responds to accusations that it enables Mugabe’s oppression with its trademark cynicism. By claiming to be “apolitical”—not getting involved in other countries’ internal affairs—Beijing absolves itself of all guilt. Indeed, China’s foreign policy decisions are apparently guided solely by economic self-interest. Beijing’s aid and investment model seeks to maximize profits by taking norms and values out of the equation. Unburdened by ethical concerns, China is happy to disregard crimes committed by the regimes it does business with, so long as the returns are substantial. This position was infamously epitomized by former Deputy Foreign Minister Zhou Wenzhong, who stated “business is business” in response to international criticism that China’s aid and investments in Africa only help to strengthen dictatorial regimes. Unsurprisingly, a growing number of African leaders look on the Chinese approach to aid and investment with relish. Even those who have established lucrative relationships with the West, like Djibouti, are willing to sign up for Chinese monetary incentives and collaborate with its geostrategic goals. Beijing has built its first military base abroad in Djibouti, choosing real estate in close proximity to an existing American naval facility. US concerns over this proximity have been ignored, perhaps because of China’s conveniently-timed investment in a new $4 billion railway linkbetween Djibouti and Ethiopia. Washington is worried Beijing could use its base in the country to freeze out other powers and cement its strategic and economic foothold in the region, but China’s generosity has already won over longtime leader Ismail Omar Guelleh. In addition to investing billions in Djibouti, China is the country’s primary lender at non-concessional rates. With China’s support, the autocratic President Guelleh has been emboldened to curb the democratic process and basic civil freedoms, attacking his political rivals with lethal force or otherwise forcing them into exile to maintain a firm grip on power. Thus far, things have gone well: with his opponents silenced, Guelleh was able to win a fourth term last year. Across Africa, this is becoming a pattern. By prioritizing profit and political expediency, Chinese government investments and partnerships actively enable democratic failures and rights abuses. As Western leaders debate how to handle China’s growing footprint in West Africa, the examples of Zimbabwe and Djibouti should provide a roadmap for what matters to Beijing and what does not. Given its own contempt for popular sovereignty and human rights, it is only logical that China regards these African dictators as natural allies. After all, they look at the world the same way.